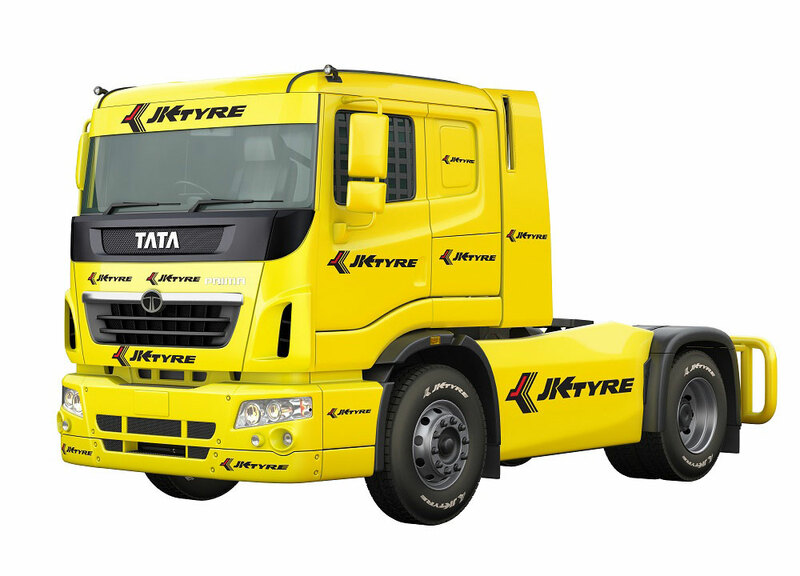 JK Tyre & Industries Ltd today announced it would partner the Tata Group for the fourth time to make the Tata T1 Prime Trucks Racing Championship an even bigger success this year. The pioneers of radial technology in India gives wheels to the country’s first and only truck racing championship again with its JETRACING range, which will play a huge role at Buddh International Circuit in Greater Noida on March 19, when the giant vehicles line up for the ultimate face-off. Developed after months of research and engineering to cater to the specific requirements of a race track, the JETRACING range of tyres has been a big hit among drivers and experts. Unique ‘tapered tread’ tyres equipped with ‘HE wire’ and ‘special wire wrap’ make the JETRACING tyres less prone to skidding and slipping even in the most challenging of conditions a driver encounters in a circuit. Layers of steel belts and tread compound boosts the speed and performance of these tyres that have for four years now become an integral part of the annual championship. These very tyres will run the 1000 Bhp Tata Prima Race Trucks, which can accelerate up to speeds of 0-160 km/hr in 10 seconds. The tyres used in the first two seasons of the Tata T1 Prima Truck Racing Championship were 315/80R22.5 size, since the last season the tyre size is 315/70R22.5, which is approved by the European and British truck racing. Lower aspect ratio of the tyre 70 series in comparison to 80 series is based on the requirement of the vehicle. This helps in keeping the centre of gravity of the vehicle lower, ensuring better stability during cornering. This is one of the unique qualities of the tyre, one that comes in handy on a track where the lap timing is 1 minute 50 seconds. Nagarjuna A, winner of last year’s winners in the Super Class category, spoke longingly of his experience of driving at the TI Prime championships. Driving against other racers in the lap was a heady mix of adrenaline rush and adventure. It was a thrilling experience as we negotiated sharp corners of the circuit at 150 km/hr. 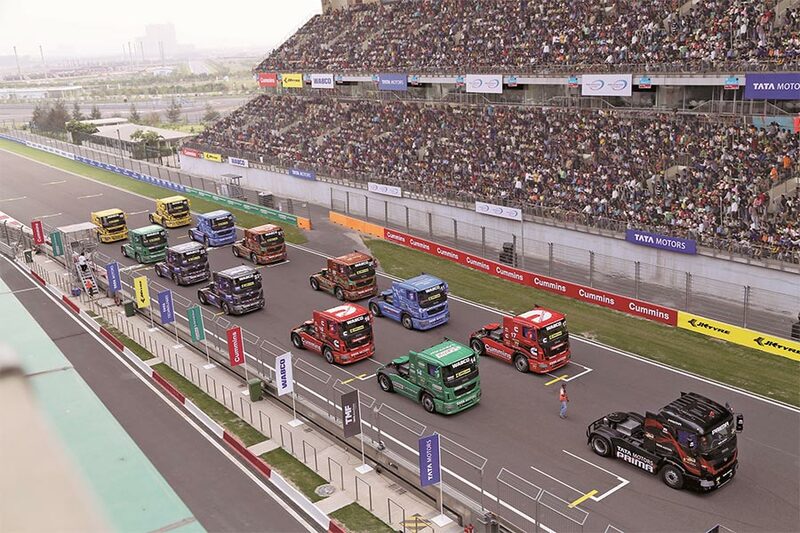 The T1 Prima Truck Racing Championship is getting better and bigger every year with increasing participation and audience interest. It will only get more popular in the time to come. Always with an eye to the future, JK Tyre introduced India to Truck Radial technology as far back as 1999. Since then, the company has been the undisputable leader in the domestic market with an ever-increasing customer base every year. Through its service centres named ‘Truck Wheels’, the company provides after-sales maintenance services for truck and bus tyres in various locations in the country. Customers can avail services like total vehicle alignment, wheel balancing, new tyre fitment/removal, tyre rotation and inflation check-up, nitrogen filling and radial tyre repair at the centres. The company has increased their manufacturing capacity through the acquisition of Laksar-based CAVENDISH Industries Ltd. It is the first Indian tyre manufacturer to offer 3-tier products targeting different consumer segments in the Truck/Bus Radial category, and is expected to boost market share. These products range from Premium, Select and Economy range of Truck/Bus tyres.